(Atlanta, Ga.) Step inside most any of the acclaimed KIPP Charter schools in the Metro Atlanta area and it will be difficult to find a staffer who doesn’t know the name Muhammad Yungai. 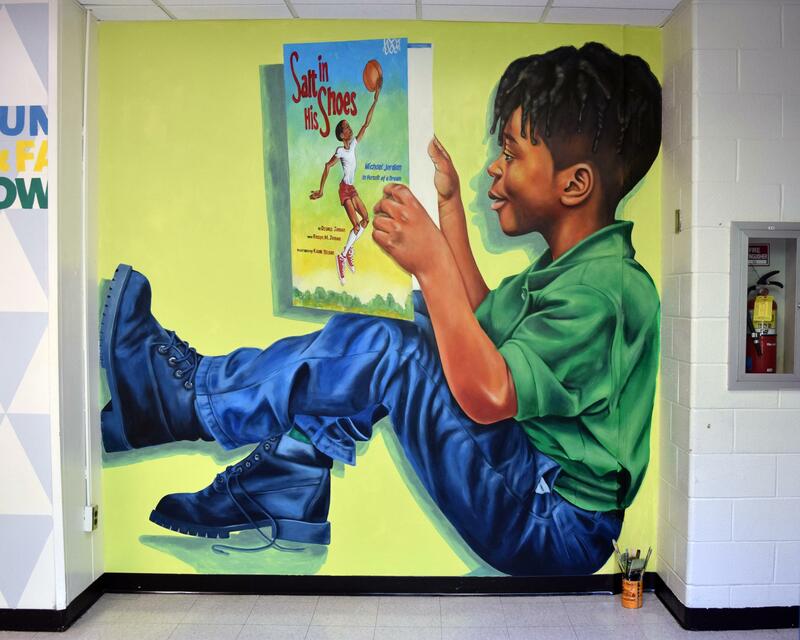 His work – vibrantly-colored murals depicting inspirational and diverse images of people of color – adorns the walls in the hallways, classrooms and even the cafeteria at the charter schools and others in the Atlanta Public Schools system. Through his painting, Yungai, a 43-year-old husband and father of two grown daughters, said he is fulfilling a deep-seated mission to inspire students and show them what he didn’t see while growing up: Black and brown people portrayed in a positive and powerful light. A self-taught artist, the New Orleans native turned long-time Atlanta resident, always had an affinity for creating art. And when his daughter was enrolled at KIPP WAYS Academy in northwest Atlanta he decided to donate his time and talent to the school. Impressed with his work, the principal invited Yungai to become the school’s visual arts teacher. Yungai took the job and embraced it as an opportunity to also learn. Over the ensuing 10 years, he immersed himself in a self-guided exploration of the basics of colors, shapes, lines and space. “I knew what I wanted to do as an artist, but I had to teach the foundation, which I had to first learn myself,” Yungai said. From there he found his passion for creating murals, and his life’s calling as an artist. It didn’t take long for his inspirational images to draw attention and soon other school principals started calling for his work. Yungai was now juggling being a teacher and a sought-after muralist. He had to make a choice. And in 2016, after he and his wife, Khadijah Pegues-Yungai, had sent both daughters off to college (a hallmark of a KIPP education), Yungai stepped out on faith and transitioned from art teacher to full-time in-demand muralist. Since then he has painted murals for seven KIPP schools in Atlanta along with Luther J. Price Middle School, also in the APS system. Last summer, he was also recruited to spend five weeks creating one of his custom designs at an elementary school in Nashville. And he’s already scheduled to return to the music city this summer to create more murals for KIPP middle and high schools. His work has also been featured at the Essence Music Festival and The Atlanta Jazz Festival. Ho-Sang said Yungai has his own style and unique way of capturing people. “The way he shades and creates portraits that are so life-like,” Ho-Sang said. “The way he uses colors is a little bit different. Yungai said he seeks to capture more than just the physical when he paints. To view some of Muhammad Yungai’s captivating work, visit https://www.instagram.com/explore/tags/muhammadyungai/. To arrange a special art presentation, lecture or an interview about his amazing ascent from art teacher to in-demand mural artist, please contact Kimathi Lewisatkimathitlewis@gmail.comor 678-790-8238.